In her popular series that looks at the trials and tribulations of a trainer, Monica Murphy helps a group of engineers to acquire presentation skills. Giving a presentation is one of the most useful skills anyone can have. The ability to apply it to numerous different situations in both a professional and personal capacity is one of the reasons why it’s one of my preferred soft skill lectures. According to research, many people fear public speaking above everything else. Some place it above flying, heights and some even put it above death. Put another way, most people would prefer to be lying in the casket than giving the eulogy. I was one of those people. I wish I had recorded the first time I delivered a training course so I could use it as an example of how not to present. However, after many years of practice, speaking in public barely features on my fear list now. I delivered a presentation skills training session to a group of highly competent engineers. They had reached the point in their careers where they were being prised away from drawing boards and asked to present to potential clients. They had the knowledge, but they needed to know how to present that knowledge effectively. We kicked the day off with viewing a recording of a presentation. They had to pick out the things that made it interesting and those that did not. It was reassuring to hear them comment that it obvious that the presenter was not at ease with his material. There were also other problems. He failed to introduce himself and he read from his slides. However, they grasped the lesson of the recording, and indeed of the course: nothing destroys a presentation faster than the presenter’s lack of knowledge on the subject. I try to incorporate plenty of two-way communication during training. This keeps participants engaged, and helps them to remember what they learned. We remember only twenty percent of what we hear compared with ninety percent of what we actually do. Over the course of the day, each of the engineers had to deliver three presentations. First, they were to deliver a two minute presentation at mid-morning, and later a five minute presentation. Finally, towards the end of the day, they gave a ten minute presentation, complete with slides if they so wished. On hearing that I was going to record this final, ten minute presentation and play it back to them, they paled a little. However, I assured them that practice really is the only way to make headway in this area and that it’s actually quite amusing. Once we had gone through the basics of presenting, it was time for their two-minute presentations. I assured them that it could be on anything they liked – so long as they were totally comfortable with their topic. The participants talked about a range of subjects. These included their first job, or their most embarrassing moment. I had spent some time earlier on the importance of a good beginning to a presentation. Introducing yourself, establishing your agenda, communicating your brief and then telling your story. I tried to emphasise the importance of finding common ground with the audience early on. You can do this by making reference to a topic that you know interests many, if not all, of them and weaving it into your presentation. We discussed each person’s presentation. They agreed that even though they had only been up there for two minutes, it felt like an eternity. This exercise helps people to get over the initial fear of presenting, and it also loosens up the participants. As a result, they are more likely to lead discussion and offer feedback to each other. I believe that they learn much more when learning from each other with plenty of laughs thrown in. The trick with giving feedback is to warn participants not to take it personally. In fairness, most of them don’t. They end up being more critical of themselves than they need be. After the feedback, we went through the techniques that enhance a presentation. These include body language, using hands for emphasis, using voice for variation, eye contact, tactfully questioning your audience to ensure understanding and even what clothing is appropriate. We also spent time on how to close a presentation well. I asked them to remember two out of nine concepts and to practice these in their next five-minute presentation. For the five-minute presentations, I gave the participants a newspaper report to use. The participants had to get a handle on their topic, deal with their nerves, and remember to use two good presentation techniques. At feedback time, someone commented that it’s difficult to think of all these things at once. The skill of appearing calm and controlled is key to becoming an excellent presenter. Many of them only realised mid-sentence that they should incorporate one of the key techniques discussed. That meant they ended up doing something spontaneous which did not necessarily work. I have seen people experimenting with a whole range of techniques! There was the guy who periodically threw his arms into the air when he remembered he was to use his hands for emphasis. Someone once decided to move around the room so that the audiences’ eyes would follow him. Unfortunately, he looked like an army officer on the march. After lunch, I spent time going through PowerPoint. In my experience, anyone unfamiliar with the programme loves it immediately. They are amazed at how quickly PowerPoint can produce a presentation. After this, I gave them 45 minutes to prepare their final presentation. I also warned them not to spend too much time creating visual aids and not enough time on what they were going to say. The ten-minute presentations give participants a chance to try out all of the day’s theory and practice. All of the engineers were noticeably more relaxed at this stage. Some of them abandoned their audience and looked at their PowerPoint masterpieces instead. Others had completely forgotten to form sentences around their bullet points. One or two managed to get the mix right. They opted for three or four slides and relied on their own expertise to fill in the details. Next we played back the recorded presentations. So we came full circle back to where we started the day. However, this time, they had to pick out things that helped or hindered their own presentation. 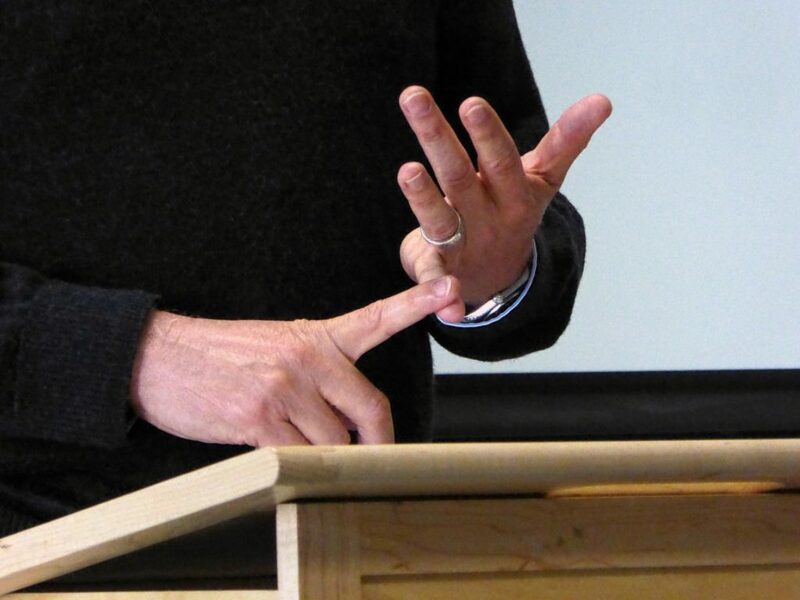 At feedback time, many agreed with me that PowerPoint should take a back seat when presenting. Because they had seen themselves presenting, they could clearly see what they needed to improve. This was a one day course, and becoming a good presenter takes much longer than that. Don’t fool yourself into thinking that you can do this in a day. What you can hope for, however, is that people come away with a clear understanding of the basics of a good presentation – knowledge, preparation and practice.